A good friend of mine used to live in Cleveland for a while. I visited him a few times and we would walk around in various neighborhoods. There was this house on Hampshire Road in Cleveland Heights that was supposed to be haunted. We walked by it a few times. It was a large, foreboding structure that was fairly well kept even though the story had it that nobody ever saw anyone go near it. We always walked by at night and there was never a sign of life except for a malevolent orange light, akin to that projected by a candle, suspended in the middle of one room on the top floor. Every time it was the same. My friend said that none of the utility meters were running, no one was ever there, etc. This was in 2002-03. I haven't been there since. We were usually pretty pissed in one way or another, so I don't remember much in the way of details. I've been thinking of taking a trip up there. I was wondering if you knew anything about this place? I know roughly where to go and all that. I was looking for more in the way of legend. I've scoured a bunch of sites and I can't find anything. Did you miss the show? Robin Swoboda's "That's Life" Cleveland morning talk show on Halloween 2008 featured a number of haunted locations and creepy legends around Cleveland. You must get this book! You may remember me mentioning being interviewed late last year for an article in West Life. Well, the author, Charles Cassady, had mentioned at the time that he was in the process of collecting stories for a book he was writing. I expressed how cool I thought that was and asked him to let me know when the book would be in stores. 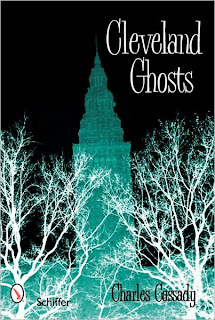 Well, back in June, he sent me an email letting me know that "Cleveland Ghosts" would be in stores by Halloween 2008. Sweet. Well tonight I dragged the wife and daughter out for a nice family movie (Saw V) and stopped in a Border's beforehand. Right when you walk in they have a Halloween/haunted-themed table. Among them was Charles' new book! I grabbed it and started thumbing through it. It looked awesome! He's got dozens of Cleveland pictures and all the ghost stories we've come to know and love. Franklin Castle, Squire's Castle and Melonheads (oh my!) Plus TONS of smaller and lesser known stories. I'm kinda hoping to get a real, more thorough, review posted in the future once I get a chance to read the whole book. But if what I've read in only a few hours is any indication... well, buy the book. You won't be sorry. Hi my name is Tammie Mccourt and i grew up on west 58th and wakefield my backyard was The Fir Avenue Cemetery. There is a huge apartment building on Wakefield avenue and right on the front of the building on the top floor the name of the street wakefield is engraved on it. Anyway the building was four apartments when we moved in in the early 80's. We had heard all kinds of stories about the apartment we lived in, that a woman was killed in the back bedroom and her daughter was watching from the closet and when she made a noise she was then killed and left in the closet. Also there was a house behind the apartment building that had burnt down and several people were killed. Now the basement is designed like dungeons and had the old furnaces that made a loud roar when they started up. Now for the first yr or so we witnessed nothing, but then my lil sister was born in the back bedroom and all hell broke lose. My sisters crib was right against the closet about 5 feet away from it, my lil sister would always be standing up in her crib trying to reach for the closet door and couldnt get it, well one day she was in her crib and the kitchen were my parents always sat was right next to the bedroom and they could hear my baby sister making all kinds of normal baby noises but then they heard a lil girls voice about 6 or 7 yrs old playing peek a boo, my mom thought it was one of us other kids and she yelled for us to come here and when we came in from the living room she freaked. she ran into the bedroom and the closet door was open and my lil sister was standing up pointing at the closet. After that all kinds of things would happen we would lose toys for days and find them in the closet, we would close the closet door and go back in a few mins later and it would be wide open. My parents slept in this room and they would always hear a lil girl crying thinking it was us or my baby sister get up check on us all and we would be fast asleep. One morning my dad was at work we older kids were at school my lil sister was still in the crib at the time, my mom was in the living room watching a show after putting her down for a nap and out of nowhere she would hear a lil girl playing peek a boo and a few more mins later my baby sister came crawling into the living room. Now she was only about 8 months old there was no way she could have gotten out of her crib without help. On easter morning 1987 my mom hid eater eggs through out the aprtment, we went to church no one home now and when we got home all the eggs were in a basket in the back bedroom. So for yrs we dealt with the lil girl spirit, she was harmless just a lil girl having fun in her spirit life. Then in 1989 all hell broke lose again when cmha decided to remodel the apartments and combine the two upper apartments into one for my parents so there would be room for all of us kids there was 6 of us at the time so a 2 bedroom apartment became 4 bedrooms 2 kitchens 2 bathrooms 2 living rooms. Then the scarey man arrived and total terror started. There is so much i can tell you but would take you days to read it, things like poltergiest activity to my father passing away in one of the bedrooms to things we saw in the graveyard, now you can find The fir avenue cemetery on deadohio. com the story was mine i had posted one year on there about expeiences we had i lived there until i was 19 and moved in 1994 my mom lived there until 1999, so many frightening things happened there. I have my own paranormal group with my sisters and we started it because of our lives living on Wakefield ave. you are actually on our friends list anything and everyting paranormal is our group. If you would like to hear more stories i would love to tell them to you. I am married now and have 2 kids of my own and live in a non haunted house in Brunswick, but i think no i know that i am scarred emotionally and maybe even mentally from growing up over there. Well you said on your page you would like to hear ghost stories so here is one for you and there is a hell of alot more than this. Oh i am going to tour Franklin's Castle tomorrow night and i am so excited and scared at the same time only because it is so close to where i grew up i actually have to go through the nieghborhood i may just drive by and see what the old Wakefield Castle as we called it looks like, i heard stories that is is dilapidated and falling down.The memories alone of the place may just be to much for me to handle, well i am done yacking have a great weekend and if you are interested in hearing more, id be happy to tell it actually makes me feel better to tell someone about it. I want to thank Billy again for registering the domain and pointing it at my site for the past two years. Thanks, Billy! Anyway. It's October people... let's get those stories in here. I'm watching an episode of a show on Discovery Channel called A Haunting and it's about a house that was haunted in Geneva Ohio in 1965. Apparently there was poltergeist activity and unexplained phenomena, but this show is known for overdramatics. Any info? Just wanted to say I love your site, and the stories that you have. Although there are sooo many hauntings around cleveland that havent been mentioned, at least that Ive come across. There are a few places on St. Clair near Collinwood High school dont quite remember the exact locations but a few nightly walks I'm sure I could stumble onto them. But the reason I'm writing mostly is I was wondering if anyone knew any of the history behind boston township with the Stratfords, and the one light post that doesnt work, or the slaughter house, or the girl scout camp that used to me located near there and the minimal and maximum security mental institutions that are there I've heard the entire story myself but its been a very long time since I went down that way and I forgot who the guy was that took my friends and I on the "guided" tour. Another creepy place u should add on your website is Red Raider. Red Raider is a street by Russell Ohio. there is a story that there is a ghost that holds a red lantern and runs through the woods. You can only see it on a clear night and your supposed too turn off your car and headlights. You can never catch this spirit it runs from you. I got a lot of stories to submit about it and i think others should hear about it. It is a very creepy place and should definitely be added. If you have any questions email me at deeman212@aol.com. Webmaster Note: I've been sitting on this contribution for a long time because Erich sent me so many pictures and I was unsure how to properly display them. While I still hope to give them a nice layout on a web page in the future I decided to put them up in my Google web album for everybody to enjoy. Sorry for the long delay, Erich... and thanks for the pics!! I have been a fan of your site for some time, and I think I may finally have something to contribute ! I work with a production company in Cleveland which puts on large shows for customers. Lights, Stages, Sound, the whole production thing. Anyways; last week we had a show inside the old Cleveland Grays Armory; undisputedly one of the cities oldest buildings, and widely thought to be haunted. Its located right next to the cities oldest graveyard, right in the center of town ! Somewhat sadly, the Grays Armory building has been rather un-restored for such a historical landmark, and ( while it is lovingly maintained by a committed group of volunteers ) , it’s really not in the best condition, and remains a somewhat forgotten city treasure. Its actually hidden in plain site behind the Cavaliers “Q” Arena, and the Indians Jacob Field. It has a large ballroom that now hosts events like amateur boxing, and the front part of the building is considered a museum. The back ( southern ) end is where bathrooms are located on the main floor, off of the “ballroom” , underneath, in the basement, is an active shooting range ( used by Cleveland police ) , and the upstairs is casually chained off , and considered “off-limits”. I had the opportunity to travel about the southern end of the building, un-supervised, while I was searching for a chair to use during my program. I found a chair, but what I also saw was kind of unexpected, and somewhat surprising. I’m attaching some of the photos I took that afternoon; I hope you find them interesting. P.S. The building is reported to be haunted, but I was very comfortable inside it, and our program went very well ! In a town known as Hartville, Ohio in Northeastern Ohio is a state park; Quail Hollow. This was one of the first settlements in this area with the houses still on the property right down the road from the Hartville Pie Factory, once known as the Wild Boar Tavern many moons ago and was part of the underground railroad. At Quail Hollow there is a super old cemetery (late 1700's to 1800's). A few of my friends and I have gone there on a few occasions. The first time I went by myself at night (yea it was freaky) and I could hear a woman humming on a path right behind the graveyard. I looked over there and didn't see anyone at first but at a second glance saw a woman in a white gown smiling weakly. I left quickly, hearing footsteps right behind me while I felt a presence following me. Many, many, many more stories occurred (if you'd like to know just e-mail me at Hippieboi@aol.com). 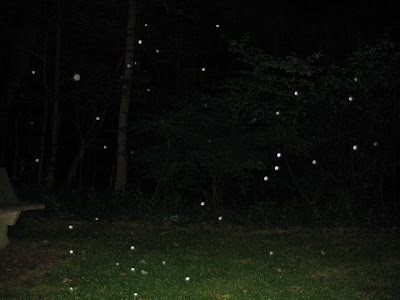 Anywho, I went snapping pictures randomly one night there one night and noticed the one picture was COVERED in orbs. I tried recreating it thinking it might have been dust, water something. I couldn't do it. And if examined closely, some of the orbs are actually illuminating from behind a few of the leaves. Heres the pic!!!! Cool blog! Franklin Castle is downright evil. I visited the old Masonic lodge on Franklin Blvd. As soon as I walked in chills ran down my spine. The Masons told me that all kinds of weird things go on in the building and that no one would even consider spending the night there. A local psychic told me that the building is some kind of portal to another place and she had seen multiple entities while in the building. If you're looking for something that's truly creepy then this is the place. The most common story behind these Mutant little creatures is that a Dr., Crowe to be exact, who lived on Wisner Road,In Kirtland Ohio, ran an orphanage with many children and did various experiments on there brains causing there heads to become larger in proportion to the rest of there bodies. It is said that they roam the woods at night looking for humans, they eat their flesh. The most notable description of a Melon Head is about 3/4 feet tall with a large head, glowing eyes, and sometimes said to have razor teeth. One day the children killed the Dr. as well as his staff. The mutants still roam the area on a killing spree. Well, I've got my own veiws on this. I WENT to Wisner Road in Kirtland, to prove what was real or what was fake. My aunt drove, her friend Meggan, My brothers, and their friend came along. We got lost in the area of Mitchel's Mill and Wisner, but we kept seeing shadows in the woods and when we came along a black gate in the woods of Wisner Road, we all had that GUT feeling. The kind of feeling that tells you that you aren't about to be in a good situation. Well my brothers and their friend thought it would be cool, to make them not seem like sissys, to get out of the car. Well they walked down a little side road for a few moments, and my aunt and I got scared, so we beeped the horn several times.. and they RAN back to the car, all diving in. They claim that there was something that ran across the road. It suddenly got extremely foggy outside.Momentarily,my brother,Keith, realized he lost his phone while running back to the car. We were in NO mood, and none of us had the courage, to turn back. 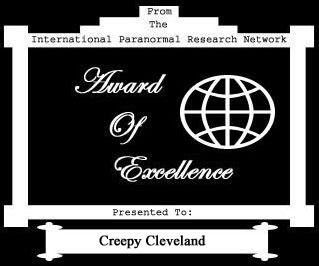 I am proud to announce Creepy Cleveland has received the International Paranormal Research Network Award of Excellence! Well... I'd never heard of the IPRN before today, but will admit to being flattered to receive an unsolicited web award from an organized paranormal group. After receiving the award I visited the IPRN site and was pleased to find what appears to be a well-organized, professional-looking page run by a group of people who are genuinely interested in investigation and education of the paranormal. Many members, including the director, David L. Frost, appear to hail from Ohio. That alone qualifies the IPRN for a plug from Creepy Cleveland! Check them out. Join the organization or just contribute to the forums. Or both! Thank you for the recognition, IPRN. I wish you luck in the future!